I made a trip to Watertown, SD to have Randy Gribble (Lake City Rod & Custom) press the kingpin bushings into the front spindles and align-bore the bushings to the proper clearance. If you wonder why I went so far away (100 miles) to have this done, you're not the only one. All I can say is I wanted it done right. 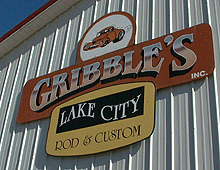 The Gribbel brothers, Randy and Kevin, have been building nostalgia rods for many years, and have driven them hundreds of thousands of miles. If anyone knows how to properly set up a drop axle car, it's them. 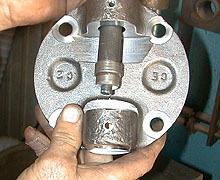 Before inserting the bushings, make sure to line up the hole in the bushing with the grease hole in the spindle. I know your saying duh! but this can easily be overlooked or installed slightly off. Doing so would prohibit you from greasing the kingpin bushings and lead to early failure. 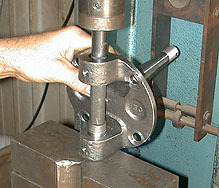 Using a hydraulic press instead of beating them in with a hammer assures the bushings go in straight and are not damaged during install. Using a new spindle as we are here makes the job easier too. Old spindles can be corroded and deformed, making this job a little more difficult. Next the bushings will be align-bored (sorry no photos) to make sure they are true and properly toleranced for the kingpins. OK, part of the fun of going to Gribbles shop is looking at their cars and some of the projects they're working on for customers. This is Dale Gibson's `32 in progress. Looking good! 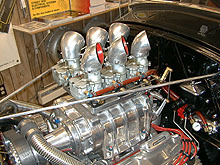 Doesn't everyone run six carbs on a blown hemi? Randy Gribbel does! Like I said, these guys do some awesome work and everything is built to DRIVE. This is one of those cars that deserves a closer look. 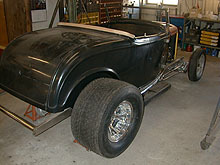 Here's a quick shot of Kevin's `32 roadster. I was lucky enough to catch the car while it was sitting still. 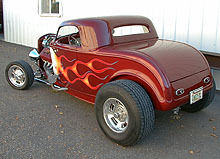 Kevin's driven this cool 4-carbed-hemi highboy down Route 66 and all over the Nation. The workmanship on all Gribbel's cars is flawless. I'm sure I'll be asking them for advice now and then as this project progresses. Thanks guys!